Agri-Science Instructor Tony Wood: Timing is Everything — CTE: It's Working! 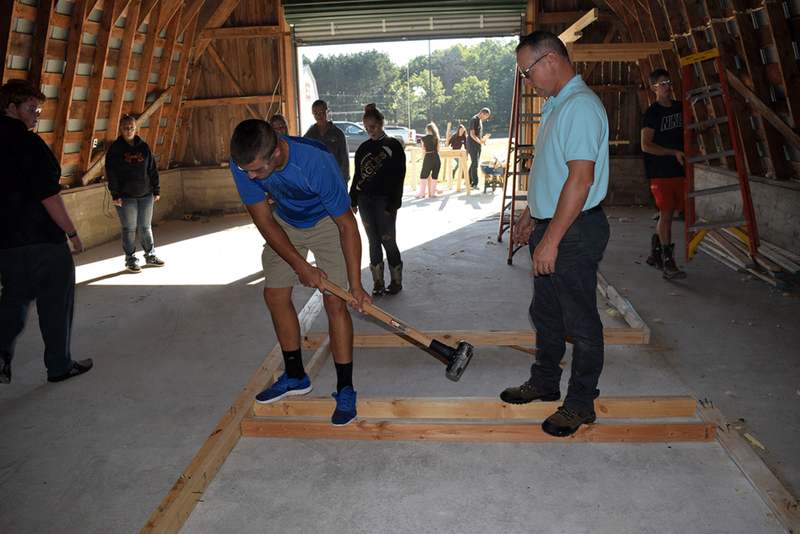 Wood’s experience as an Industrial Arts teacher in Harrison comes in handy as he and his students work on the barn. Repurposing a barn on the Magnus Center property is one of the first priorities for Ag-Science students. The early days for Ag-Science students include laying out plans for animal housing and the surrounding property. Each morning, Ag-Science students are given the responsibility of hanging the American flag. At the end of the day, their neighbors in CTE’s Health Occupations class remove it. 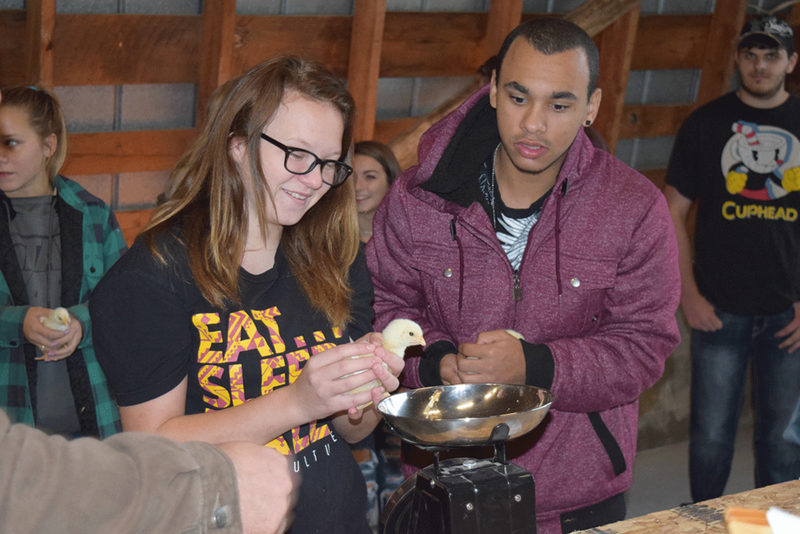 CTE’s Ag-Science students are raising chickens as part of their curriculum. What appeals to you about teaching Ag-Sci in the CTE program? TW: I enjoy teaching and I enjoy working in agriculture. This is a wonderful opportunity to combine these two huge aspects of my life. It is very exciting to have the opportunity to work with the RESD and local businesses to develop a new Ag-Science program in our community. Can you summarize your work experience in a few sentences? TW: I have been a teacher of industrial technology for 20 years. The first three years of my career were at Bay City Public Schools and the past 17 years have been at Harrison Community Schools. During this same time, my wife and I began farming her family’s farm in Clare. What in your career experience has prepared you for this job? What can you share with students that will really resonate? TW: I have been in education for many years and I enjoy working with students! I feel students learn best when they can relate to and find meaning in the content of the class. I’m going to work hard to find those connections with students to help engage them in their education on a daily basis. A message for my students would be that they have the unique opportunity to forge their future, to start building the future they want to live today and not let that opportunity pass by. What are the challenges in teaching a class like this? What parts of your class do you think students will really enjoy and why? TW: One of the biggest challenges in this type of class is that the field of agriculture is very broad, as are the interests of students in the program. I believe students will enjoy learning about the many areas of agriculture that they may not have been familiar with. I plan to incorporate both small and large animals in our program, guest speakers who are experts in their agricultural field and field trips to learn about different types of agricultural industries first hand. I think students will truly enjoy these types of experiences. How are you spending your early days on the job? TW: My first goal in the classroom is to get to know my students and design a program that will meet their unique interests and needs. With the Ag-Science program in its first year, I have been attending meetings and workshops, reaching out to other Ag-Science educators and making contact in the local agribusiness community to form our advisory committee. In addition, we are looking at space and facilities to determine what will best meet the needs of students in this new program. What’s the proudest moment or accomplishment of your career? TW: I am most proud when students accomplish what they once believed they could not. When did you know you’d become an educator, and what was the spark? TW: I began planning to be an educator my senior year of high school. I have always enjoyed learning new things, and over the course of my education I have had the privilege of having teachers that made learning fun, engaging and relevant. I have the desire to be that teacher for the students in my class. You obviously have strong feelings about education, and career tech in particular. Why is that? What brought you to this point? TW: I believe career readiness and preparedness is one of the most important things we can help prepare students for. It’s my goal that students leave with the employability skills needed to be successful in the workplace, regardless if their place of employment is in agriculture or a completely different field. What details about your personal life can you share – family, hobbies, etc.? TW: My wife Beth and I have been together 24 years, and we have two boys ages 13 and 15. Together, we farm and own the original farmsteads on her mother’s and father’s sides of the family. Both farmsteads have been in the family for four-plus generations. Our boys are very active in school, including cross country, soccer, skiing and track, in addition to their help on the farm. They both are also members of the Country Neighbors 4-H club in Clare County and raise swine and beef to enter in the county fair.